Nebraska Supreme Court Chief Justice Michael Heavican appraised the judicial branch’s accomplishments over the past decade and urged lawmakers to carefully consider proposed cuts to the state’s court system in his State of the Judiciary address Jan. 19. Heavican told legislators that he had both good and bad news to deliver in his annual address, the tenth he has delivered to the Legislature. He began by summarizing factors that increasingly burden the state’s court system. The first, he said, is the growing number of Nebraskans who represent themselves in court without legal assistance. 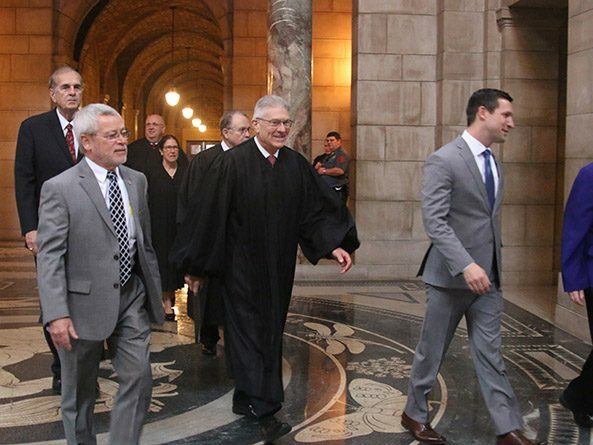 “This court, the Nebraska State Bar Association, hundreds of volunteer lawyers and both the Creighton University School of Law and the University of Nebraska College of Law have worked diligently to lessen the problems that unrepresented parties pose to our court system,” he said. The Access to Justice Committee also is working to increase access to legal services in Nebraska, Heavican said, by creating self-help centers at courthouses in Omaha, Lincoln, Grand Island, Scottsbluff, Kearney and Norfolk. “The committee will try to tackle special problems of access to justice for Nebraska’s minority communities and seek ways to fund legal aid and lawyer volunteer services,” he said. It also will look for ways to attract lawyers to the state’s rural areas, which face a critical shortage of legal services, Heavican said. The shortage also makes it difficult to fill vacancies for judgeships in the state’s third congressional district, he added. The need for interpreters is the second major workload challenge for the state’s court system, Heavican said. In 2015, Nebraska’s courts needed 133 interpreters speaking 43 different languages, including Spanish, Arabic and Somali. Over the last 10 years, he said, the courts have created a system to certify interpreters and adopted an interpreter code of ethics. “This system uses technology to provide scarce and unique resources for all of our courthouses, however remote or isolated, with needed interpreter services,” he said. Technology also has made Nebraska’s courts more accessible to the public, the chief justice said. Many trial courts have teleconferencing capabilities, Heavican said, and on March 1, all trial courts will provide television, radio and electronic coverage of proceedings. In 2016, he added, 650,000 court documents were filed electronically, and the courts electronically collected approximately $21 million in fines and fees. Heavican also summarized major programs the judiciary has taken up at the Legislature’s behest. The first program allows judges to appoint legal guardians for elderly and mentally or physically disabled Nebraskans if they have no one else to represent them. In most states, public guardianship programs are housed under the executive branch, Heavican said, but the Nebraska Legislature chose the court system to administer it. The court system also assembled a juvenile justice program from scratch after the Legislature requested it, Heavican added. But Heavican said the justice reinvestment program, passed into law by the Legislature in 2015 as LB605, would be eliminated under an $8.2 million budget cut suggested by Gov. Pete Ricketts. The program, meant to slow the rate of imprisonment and recidivism for short-term criminals by using probation, drug treatment and other measures, was developed and agreed to by the legislative, executive and judicial branches, he said. To meet the proposed cuts, Heavican said, the judicial branch would have to cancel vouchers used to pay for short-term residential drug treatment, the intensive drug treatment program and other probation options in addition to delaying the hiring of new employees, including probation officers.